An Elegant Oasis in the Heart of San Jose! Holiday Inn San Jose Aurola has 195 Smoke-Free rooms ranging from Presidential Suite to Standard. The Aurola Holiday Inn’s rated five stars and four green leaves for Sustainable Tourism. It’s a perfect location for visiting San José before or after your country tour. The Aurola Holiday Inn is the kind of quality you can expect from a five-star hotel. Plus it is conveniently located in downtown San José. With its spacious lobby overlooking beautiful Morazán Park, the Aurola Holiday Inn also boasts a spectacular view of the city from their 17th-floor restaurant! The Hotel Aurola Holiday Inn is committed to your comfort. The entire Aurola Holiday Inn is Smoke-Free. Your room options have a wide variety of comforts for your stay. Including free local calls, high-speed internet, room service, air conditioning and even your bathrobe! Some rooms have their jacuzzi and sauna right in the room. This is one of the best hotels in downtown San Jose and is close to everything! The Hotel Aurola Holiday Inn’s rated four green leaves for Sustainable Tourism. Proving that it’s possible to provide all your creature comforts while still respecting the creatures that Costa Rica is known for. 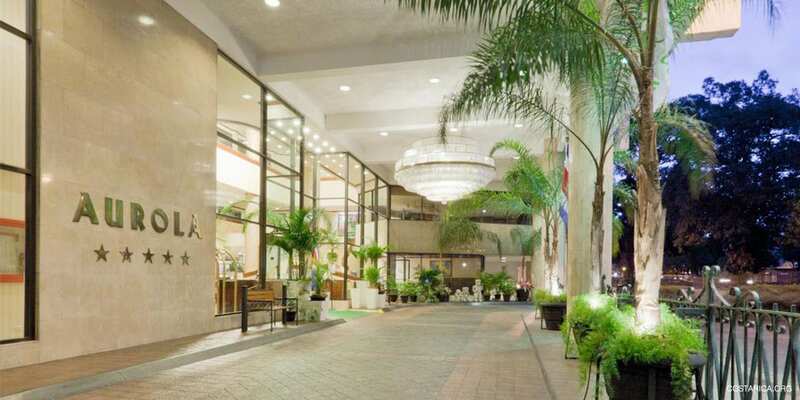 If you are traveling for business, the Holiday Inn is the best choice in San Jose. It provides the space and services you need for any deal. The Aurola Holiday Inn’s Executive Reception service allows you up to two hours of free international phone calls, computer and printer, high-speed internet, fax machine, scanner, and photocopy services. The Aurola Holiday Inn has six different meeting rooms which adjustable for meetings of up to 400 people. For presentations, overhead, LCD and slide projectors are available. As well as microphones, podiums, and any other technology you would need to make your meeting a success. Hotel Aurola Holiday Inn – How convenient! But you won’t spend all your time in the room or meetings at Holiday Inn San Jose Aurola, you want to see San José! You won’t have to worry about confusing bus routes or paying for a taxi. Here you can easily walk to all the sites from the Aurola Holiday Inn. There are many tours available. Most people would like at least one night to tour this city with a group or on their own. Beyond the Morazán Park at your doorstep, renowned for its Temple of Music, you can see the National and Central Parks, various museums and the National Theater. There are a wide variety of available days tours in San Jose, Costa Rica that can be set up from the hotel concierge or before your arrival. When you are ready to leave the city, it is possible to get to just about any part of country by ground transportation or domestic flight.